POLITICAL TIDBITS: I love Melania Trump’s blue-grey suit at Donald’ s inauguration, with its ultra-chic bias-cut overlapping bolero collar. Yugoslav-born new US First Lady to undoubtedly dictate fashion trends in America and the world, the way Jackie Kennedy did in early ‘60s. Barack Obama, who somersaulted from being a Chicago community organizer to White House, warns successor that he won’t be silent if America’s core values would be trampled upon. I love Melania Trump’s blue-grey suit at Donald’ s inauguration, with its ultra-chic bias-cut overlapping bolero collar. Yugoslav-born new US First Lady to undoubtedly dictate fashion trends in America and the world, the way Jackie Kennedy did in early ‘60s. Barack Obama, who somersaulted from being a Chicago community organizer to White House, warns successor that he won’t be silent if America’s core values would be trampled upon. US First Lady Melania Trump in gorgeous blue power-suit with exquisite bias cut collar. 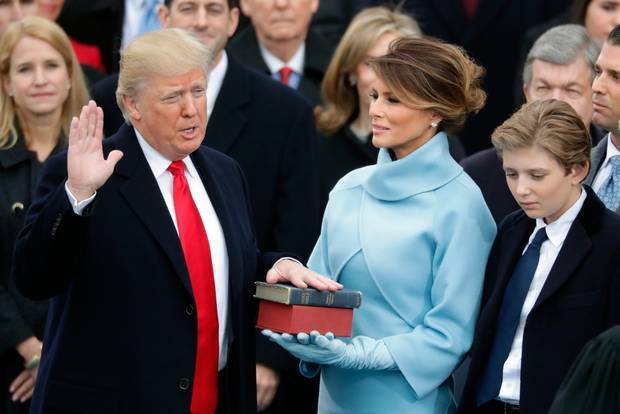 holding the Bible as husband Donald Trump takes his oath of office. There are a good number of things one can say about the American people, but what I admire most is their wholehearted dedication and militancy when it comes to defending their beliefs and rights. Take the mammoth crowds that converged and swelled in many American cities to protest the incoming regime of Donald Trump, the 45th US President, last Friday, with perhaps the biggest crowds assembled right in the heart of the nation’s capital, Washington, D.C.---and in the dead of winter. There were no estimates on the size of what has come to be called the "Women's March on Washington," but from media comparison with previous crowds it was well over 300,000. News accounts also indicate that Donald Trump was sworn into office last Jan. 20 with the lowest acceptance rating in recent American history at 32%, and indeed the size of the protest crowds in various US cities supports this finding . A parallel consideration was that most of those women marching vs. the Trump presidency were family people---wives and mothers with presumably small kids left in their homes. Consider further that unlike in our Filipino setting, where many of us have helpers or relatives we could leave our kids with, there are virtually none of those for US protesters and yet they filled that long narrow road in front of the National Mall in D.C. and in other cities, such as Chicago, LA, San Francisco, Detroit and others. Among the protest marchers in Austin, Texas was my niece Rochelle, daughter of my late brother Roger Olivares, who with her husband Justin Fleury, marched that day with their months-old baby girl, Sylvie, all bundled up for the winter, snugged close to her mom’s chest in a baby carrier. Could we do that here? There were things I didn't like about the incoming President of the US, but there were also things I liked about the inaugural ceremonies. I just adored the gorgeous custom-made pale blue-grey power-suit worn by new US First Lady Melania Trump for husband Donald’s inaugural, as she held the Bible dating from Abraham Lincoln on which he took his oath before the US Chief Justice. Like all political commentators I fight for what I say, alongside our male counterparts, but in terms of clothes and looking gorgeous, I am very much a woman and I loved the way the collar of Melania Trump’s suit was cut from two large bias pieces to overlap on each other. It was sartorial magnificence from Ralph Lauren. For the inaugural ball later that day, the Yugoslav (now Slovenia)-born former model stunned the fashion world when she wore a sleek off-the-shoulder cream colored dress with a thigh-high slit, “finished with a sculpted ruffle that cascaded down the front of the gown and cinched at the waist with a red ribbon." That inaugural gown was designed by New York-based Herve Pierre who, accounts said, struck out on his own after having worked as creative director for famed Spanish label Carolina Herrera. 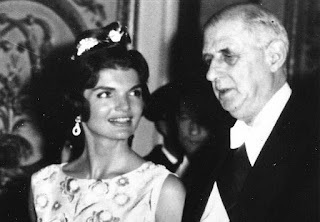 Jacqueline Kennedy captures heart of French President Charles De Gaulle, prompting her husband, President Kennedy to say "I am the man who accompanied Jackie Kennedy to Paris"
It’s easy to see how former model Melania Trump will be dictating the fashion temperature not just for the US, but the world as well---the way the classy, inimitable US First Lady Jacqueline Bouvier Kennedy did in the early ‘60s, when every woman (including this blogger) strove hard to look like her. 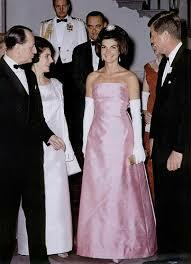 I remember how Jackie captivated French President Charles de Gaulle at the state banquet he hosted for US President John F. Kennedy and his lady in the glittering Hall of Mirrors in the grand palace of Versailles in the outskirts of Paris, where she wore a magnificent Balenciaga. So enthralled were the Parisians with the US First Lady, herself descended from French ancestors, that all President Kennedy could say was, “I’m the man who accompanied Jackie Kennedy to Paris.” The Vassar and French-educated Jackie was credited with ushering the White House into a cultural renaissance, with culture historians still referring to the all-too-brief Kennedy reign as "Camelot." Melania Trump promises to be as sensational-looking, albeit a bit wanting in culture and savoir-fair, so that our President Digong already admits to being "envious" of Donald Trump. 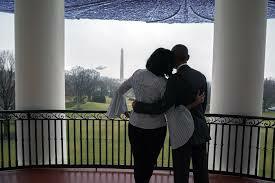 I also loved that photo of outgoing President Barrack Obama and wife Michelle looking out on Pennsylvania Avenue from the White House porch for the last time, just prior to their departure for the Trump oath-taking at the steps of the US Capitol. The Obamas stood by the porch of what they had called home for eight years, arms around each other’s waist and their heads touching, perhaps whispering sweet-nothings. Sobra ang pagka sweet ng dalawang ito. I also loved Barrack Obama’s farewell speech in his native Chicago just a few days before his second term ended, where he recalled the tough days at the White House and thanked the American people for their support for him. I must be truly getting on in years, for in the middle of Obama’s speech I found myself crying, feeling suddenly so sentimental about this boyish exiting President. That was quite ironic, for I was staunchly for Hillary Clinton in the bitter race between her and Obama for the Democratic primary in 2008. I cried buckets when Hillary made her concession speech in Washington D.C. after losing the nomination to Obama. At that time, I just couldn’t believe that the former First Lady could lose to a guy whose best qualification for the toughest job in the world---being US President---was having been a community organizer in Chicago. But to go back to Hillary Clinton, that was truly a class act she did---showing up for her bitter political adversary's inaugural, when the entire intelligence community of the US had been hammering about how Russia hacked the election returns in America where she was the protagonist and might have won had the anomaly not happened. The youthful first black President, who retired from the world’s toughest job at age 55, had a way of growing into the job---and on people. I especially like the way he warned his successor that he won’t keep silent if he finds American core values and rights being trampled upon by the new guy on the block (who's so much like our President Digong in that he says what’s on his mind without the seeming ability to bounce it first on his advisers). As President Trump's regime is ushered in, the whole world is on tenterhooks as it tries to anticipate what he would say and do next. Though Obama left a letter at the White House Oval Office for his successor---a time-honored tradition of outgoing US presidents to do---indicating doubtless some advice on how to survive the White House, Barack Obama made it clear---he won’t be silent if circumstances warrant that he speak out. As America undergoes not only a shift in leadership but also a generational gap between outgoing and incoming leaders, let’s pray that Trump’s presidency won’t be so disjointed as he leads the democratic world.